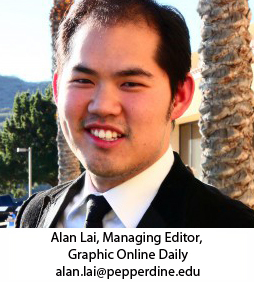 Al Lai is the President of Pepperdine Graphic Media, the student media and marketing conglomerate of Pepperdine. Al oversees a 125-person staff and he is entrusted with integrating all branches of PGM together. Al has been an active player in the creation of PGM. He started in the Spring of 2010 as a video contributor and by Fall 2011, he was promoted to Multimedia Produce. During Spring 2012, as the Online Managing Editor the website went on to become a daily online publication as well as expand the PGM brand through new social media platforms. Under his work, the 24/7 student news website has increased its page views by over 312%. Al is from Sao Paulo, Brazil and he is currently majoring in Integrated Marketing Communication, Advertising and Media Production. He currently is a Producer of Good Morning Malibu and the Co-Founder of the Delta Sigma Pi business fraternity. 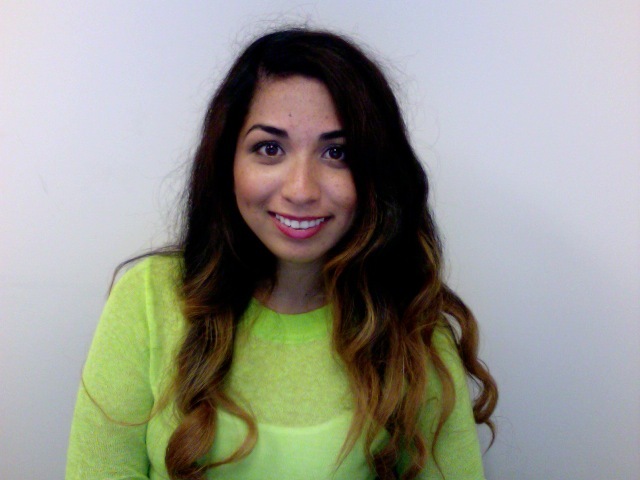 Nikki Torriente is the Executive Editor of Pepperdine Graphic Media. Nikki is a senior and is ending her fourth and final year with the Graphic. She joined as a writer, gravitating toward Life & Arts because of her love for music, movies and pop culture. A double major in Journalism and Creative Writing with a minor in Spanish, Nikki loves writing and uses any opportunity she can to use her talent. Fall of 2012, Nikki took on the role as Creative Director for the Graphic and Currents Editor in Chief. Although it was a great challenge to balance both roles, she enjoyed the challenge and was able to grow as a leader. Naturally, Nikki loves the newsroom and couldn’t see it in herself to separate herself even though it was her last semester. She sees the spring as a chance to foster great relationships with the largest staff PGM has seen since its fruition and mentor her peers. A Disney aficionado, she one day hopes to work for the Mouse House or Marvel Studios. 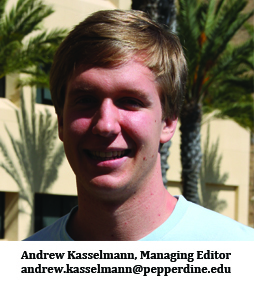 Andrew Kasselmann is the Managing Editor of the Graphic. He oversees Pepperdine’s award-winning weekly newspaper, and is focused on giving a quality product to the Pepperdine and Malibu communities by building on the Graphic’s reputation for accurate and fair coverage. Andrew has been a part of Pepperdine’s student media programs since his freshman year in 2010. After working in news, sports and contributing while studying abroad in Heidelberg, Germany, Andrew became the Managing Editor in his junior year. Andrew is majoring in Economics with a minor in History. In addition to overseeing the newspaper’s daily operations, he mentors for a freshman seminar class and helps to coach the Pepperdine men’s club soccer team. Whitney Ashton is the current Managing Editor of the Graphic Online Daily. She oversees a staff of student reporters, v-loggers, producers, writers and photographers. Her previous positions have included News Assistant and Assistant News Editor for the Graphic. She and the Graphic online staff are committed to bringing the latest breaking news to the Pepperdine and local community while striving to maintain the highest standard of journalistic ethics. With a passion for all things news, Whitney also hosts her own radio show, “Malibu After Dark,” on KWVS, Malibu’s only radio station. In addition, she is also a v-logger for GOD. She has decided to embrace the changing world of journalism. GOD supplies daily real-time news 24/7. Online journalism is the future and the endless online opportunities make journalism and Pepperdine Graphic Media’s future bright. Whitney is a Southern California native and currently in her sophomore year at Pepperdine University. She is majoring in journalism with a double emphasis in print and broadcast. 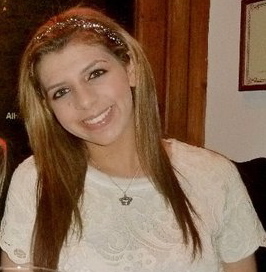 Jessica Abu-Ghattas is the Editor of Currents Magazine, PGM’s semesterly lifestyle magazine. She has been a part of PGM since 2009 and has held numerous positions on the Graphic staff, including Perspectives Editor, Assistant Life & Arts Editor and News Assistant. During her junior year, she served as Online Managing Editor in the fall and Managing Editor of the Graphic in the spring. The Corona, Calif. native will graduate this spring with a B.A. in Journalism and a Certificate in Conflict Management from the Straus Institute of Dispute Resolution at Pepperdine School of Law. In addition to her work with PGM, she is a member of Lambda Pi Eta Communication Honor Society and Alpha Kappa Psi business fraternity. 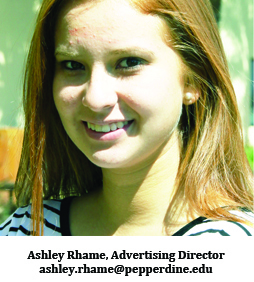 Ashley Rhame is the Business Manager of Pepperdine Graphic Media. She was announced to the position in April 2012. Ashley is responsible for all business office functions and oversees the advertising, marketing and public relations teams. His duties also include directing circulation and cash management as well as revenue analysis and budgeting. As Business Manager, Ashley leads, motivates and implements the strategic vision of PGM along with his team of talented sales representatives and marketing associates. Ashley is responsible for developing new revenue streams and improving profitability and operational efficiency. In addition, Ashley directs operations and sales for the Housing Guide, the campus housing and real estate magazine currently in its third year. She also oversees the sales and promotion of PGM Outdoor, the out-of-home advertising brand in its first full school year. Ashley is a Business major from San Diego, California who studied abroad in Germany during her sophomore year. She speaks English, Spanish, German and Japanese and is also a member of Alpha Phi on campus where she works as the Director of Social Events.